Companionship | Community carers to socialise, attend appointment and go shopping with. Loving Angels Care is more than just care at home, it’s about supporting you do the things you enjoy, whether that be socialising with friends, shopping or making the most of your favourite hobbies. Our kind and caring team will support you to live your life fully. If you aren’t getting out and about as much as you would like, or just want to enjoy a chat over a coffee and biscuits at home, we are here. 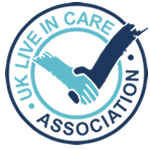 Our care team love their jobs because they get to share good conversation with our clients, it really is their pleasure to be your companion.